BackTpack was designed by a physical therapist to reduce pain and train tall strong posture with everyday carrying. Tall strong posture is the foundation of fitness and injury prevention. With BackTpack, side-bags apply the load onto the vertical spinal axis so that bones, muscles, and all the systems of the body can work in harmony with gravity. BackTpack provides access to your items at all times, organized in multiple compartments. Secure location at your sides deters access by others. It is safe for users and those around you when in crowded areas. You have better balance, control, and awareness of the space you occupy. You can sit with it on, avoiding the frequent twisting and bending required to remove and put on other bags. The Lap-Strap feature of BackTpack transfers the load to your thighs and off your shoulders and spine when you sit and when you squat. BackTpack 4?s Hip-Loading belt may be used when necessary for long distances, heavy loads or spinal pathology, to take some load off the shoulders and spine and transfer it to the hips. BackTpack 4 also has a unique Hip-Width Adjuster which fits all hip sizes, and holds the bag from sliding forward when bending forward or riding a bicycle. 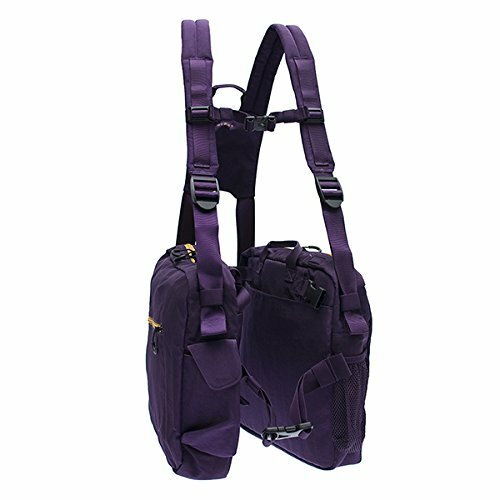 Why does the load feel lighter with BackTpack? With a conventional backpack the load is behind you, but the support is at the front of your shoulders, creating a horizontal force component. This horizontal component is added to the weight of the load. With BackTpack there is no horizontal force. Less total force is required, so the load feels lighter! Why can you stand straight with BackTpack? The load aligns vertically with your center of gravity, unlike a conventional backpack, which places the load behind you. No more leaning forward to keep from falling over, even if the load is increased. One size fits adults and children from 4 feet and up. Highly adjustable to accommodate different body types and body sizes. Hip-loading belt is an integral part of the bag, for the option of transferring load off of spine to hips. If you have any questions about this product by BackTpack, contact us by completing and submitting the form below. If you are looking for a specif part number, please include it with your message.